IP addressing design is a topic that follows every networker from the basic to the architect level of experience. Usually we just pick a random range from RFC1918 and address all the devices. But then VPN happens, and with VPN comes the risk of overlapping. How do we fix overlapping? With NAT of course! In this post I’ll show how to use twice NAT to allow VPN connections with overlapping addresses. We can see in the topology both local and remote network use addressing 10.99.0.0/24. The local PC2 must reach remote PC1. To fix the overlapping we need to NAT on ASA-NAT both networks to two subnets not used on both sides. 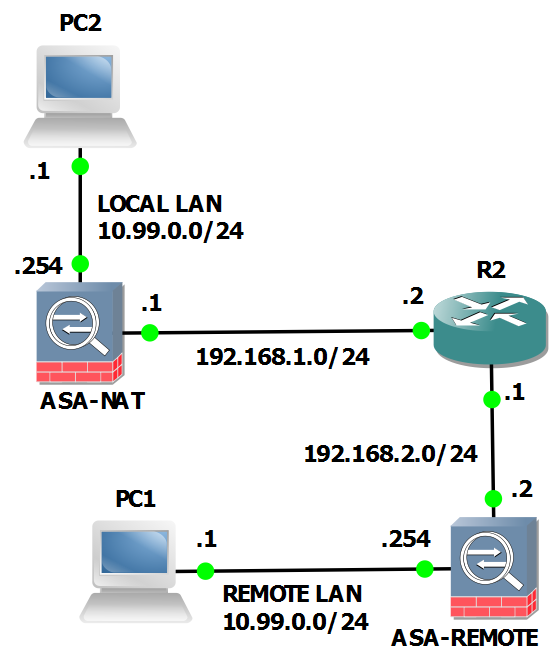 Network LOCAL LAN 10.99.0.0/24 will be seen as 10.101.0.0/24 from REMOTE LAN. Network REMOTE LAN 10.99.0.0/24 will be seen as 10.100.0.0/24 from LOCAL LAN. A full network NAT will be used so a host 10.99.0.1 on LOCAL LAN will be natted ad 10.101.0.1 to REMOTE LAN. This is a better choice than nat overload when remote services must be reached. If you’re familiar with VPN configuration on ASA or IOS you know a cryptomap is involved. A cryptomap is an ACL that defines the traffic that will be encrypted and sent to the remote VPN peer. This could be quite confusing, the destination address is the same subnet of the LOCAL LAN, but we’ll see why it works (hint: order of operation). All the magic happens on device ASA-NAT. It is the same as AS-LAN but I used different names to make the nat command more clear. The second part of the command destination translates the remote network ASA-NATTED-REMOTE (10.101.0.0/24) as ASA-REMOTE (10.99.0.0/24). The final result creates a packet with source 10.100.0.0/24 and destination 10.99.0.0/24 that perfectly matches the cryptomap we created so the traffic correctly enters the VPN. For a better understanding of the whole process we can use the packet tracer and see the steps. I removed some lines for a better output. In phase 2 the destination IP of the packet is un-natted from 10.101.0.1 to 10.99.0.1. Notice: there’s no routing involved here, the traffic is diverted to the outside interface by the NAT rule, overriding the routing table. I want to thank my friend (and happy customer) Andrea (the creator of Unified Networking Lab) for the question he sent me that gave me the chance to lab this feature and write this post. I use to configure NAT on both firewalls for this kind of overlapping but in this case we wanted to have the same results without any NAT on remote firewall. Comment if you need clarifications or help on this topic.